100% US Made. Pulls 2,688 CFM and feeds to a 55 gallon drum (you supply). Can be ceiling, wall or floor mounted…a Woodmaster exclusive. Handles several machines. Both housing and blades are sparkproof aluminum for maximum fire safety. Air Suction Capacity: 2,688 C.F.M. Impeller: 13-inch diameter, sparkproof, heavy-duty aluminum with 8 precision-balanced, self-cleaning, radial blades. 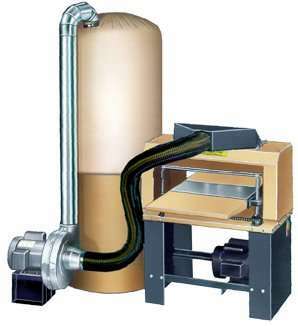 Filter Bag: 4 micron, 25″ diameter x 45″ depth. Motor: 3 HP, totally enclosed, fan-cooled, 220V, single-phase,14 amp complete with magnetic starter switch, 8-foot cord and plug. Height: 6 ft with inflated filter bag and drum.